Following the dissolution of the AirAsia Japan joint venture with the AirAsia Group that allowed the use of the AirAsia brand, All Nippon Airways will re-launch the Tokyo Narita-based operation in late Dec-2013 under a new brand to be announced in Aug-2013. This is not merely about re-painting aircraft and updating signage. ANA is effectively starting from scratch. It will keep the AOC, employees and relationships, but must source new aircraft since the existing ones are supplied by AirAsia, as is AirAsia Japan's booking system. And there are countless other projects big and small that must be undertaken. This is no small task to be completed in less than six months. The challenge is higher when considering ANA is a full-service carrier and its core knowledge is not in the LCC spectrum. ANA gained some LCC experience through the launch of Peach and AirAsia Japan, but it was largely in the backseat during those projects and input was not always constructive. To its credit, ANA has learned considerably about LCCs in the past three years, but is it ready to take the reins? ANA and AirAsia on 25-Jun-2013 announced the dissolution of their 2011 joint venture that saw the launch of AirAsia Japan in Aug-2012. At the time the two said the AirAsia Japan brand would remain until 31-Oct-2013, at which point AirAsia would take AirAsia Japan's aircraft back and ANA would assume control and later announce its plans for the operation. ANA had a 51% stake on a capital basis but 67% on a voting basis. On 28-Jun-2013 ANA completed a stock transfer with AirAsia that saw ANA take 100% control of AirAsia Japan. AirAsia Japan operated with aircraft and brand rights leased from the AirAsia Group; these continue until Oct-2013. The AirAsia Japan joint venture stumbles. 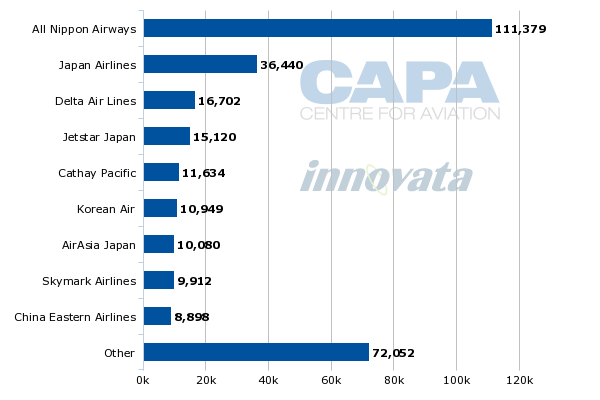 Can LCCs survive in Japan? On 30-Jul-2013 ANA gave a strategic update that included a broad outline of the future for AirAsia Japan. ANA will shut down the operation for Nov-2013 and much of Dec-2013 prior to a relaunch at an unspecified point in late Dec-2013. ANA will announce branding details in Aug-2013 with flight information to be announced from Sep-2013. ANA says the brand concept will be: "Make leisure time valuable time". This is perhaps a direct rebuke of AirAsia Japan's shortcomings with time that it became infamous for: longer check-in time requirements than competitors' as well as on time performance that may be acceptable to a foreign LCC but not Japan's super-efficient and full-service carriers that have high performance rates. This pause will allow ANA to transition the operation, which will require, amongst other things, its own reservation system. A new culture will need to be established while strategy will have to be re-defined. A re-launch could attract greater publicity than the weak attention that resulted from cost-minded AirAsia being in charge of AirAsia Japan's launch. Timeouts can have silver linings in allowing an operation to take stock rather than be encumbered with the daily demands of running an active airline; Tigerair Australia discovered this during its forced Jul-2011 grounding. The suspension comes during a relatively light period of travel. So ANA will continue to have a second LCC in its portfolio, the first being Osaka Kansai-based Peach Aviation, which launched in Mar-2012 and has seen the most success of the new LCCs. ANA has only a minority shareholding in Peach. There had been brief speculation ANA could look to consolidate its Narita LCC business with Peach, but Peach was defiant in its opposition to being involved with the messy AirAsia Japan situation. Peach CEO Shinichi Inoue told Nikkei: "AirAsia Japan and Peach have obviously different cultures from the start. Besides, they are not a holder of Haneda slots. If it is Narita, we can get the slots and spots by ourselves. After all, we have no merit to merge with AirAsia Japan right now." The complex situation of ANA having two domestic LCCs was born out of ANA first launching Peach but later agreeing to be a partner with AirAsia rather than have AirAsia partner with rival Skymark, and thus be unable to control the impact of an AirAsia-branded LCC. AirAsia Japan operations will start to wind down in Sep-2013. ANA says AirAsia Japan will have four A320s for operation in Sep-2013 and three in Oct-2013. AirAsia Japan will shut its nascent Nagoya base from 01-Sep-2013 while Tokyo Narita reductions will begin in Oct-2013. AirAsia Japan will suspend 14 daily services from 01-Sep-2013 to 26-Oct-2013, affecting 14,000 passengers. Tokyo Narita–Sapporo: Frequency reduction from three times daily to daily. AirAsia Japan launched in Aug-2012 with two A320s, building up to its present five A320s. ANA says it intends to re-launch the operation with two A320s from an un-stated source. 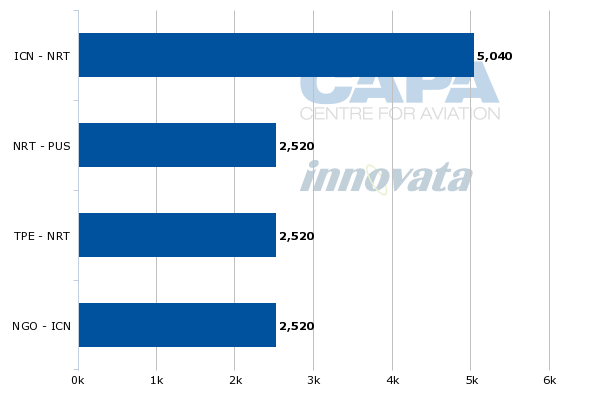 While this will effectively set AirAsia Japan back 16 months, by Mar-2014 ANA expects the operation to have five A320s, setting it back nine months or so. 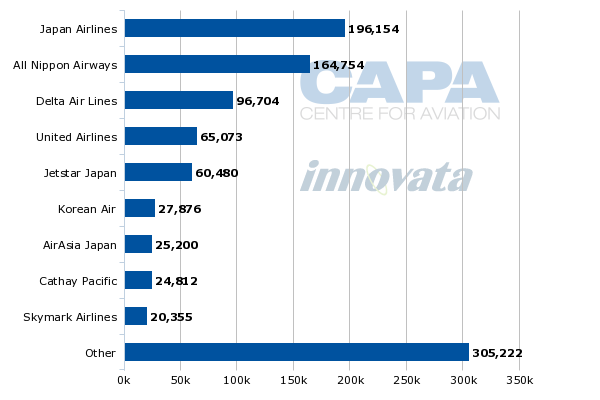 But AirAsia Japan has already been a laggard. 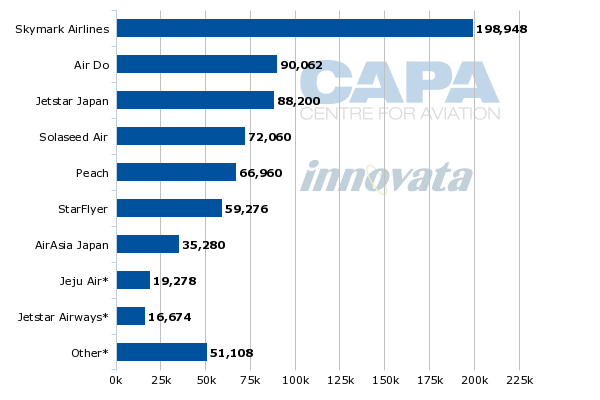 Peach Aviation in Aug-2013 will take delivery of its 10th A320 while Jetstar Japan has 13 A320s, growing much faster than Peach. But Jetstar Japan has had to slow down growth, including postponing its Osaka Kansai base, and not all of that growth has been absorbed, whereas Peach has been steady. The pull-down of AirAsia Japan should give some short-term reprieve to Jetstar Japan as there will be fewer budget options for the market. 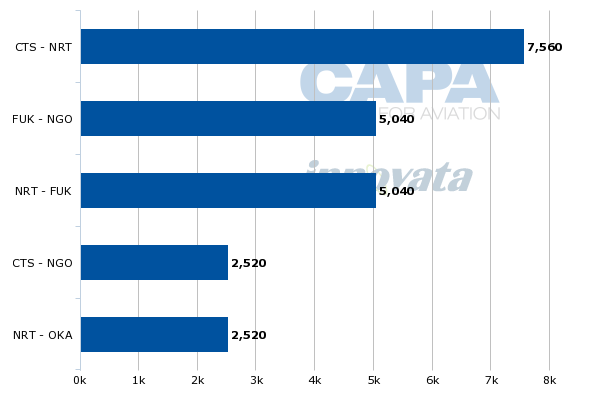 But capacity increases were already too large as consumer uptake lagged and AirAsia Japan's pull-down is largely occurring in the off-season, when the Narita LCCs have been struggling to gain passengers. 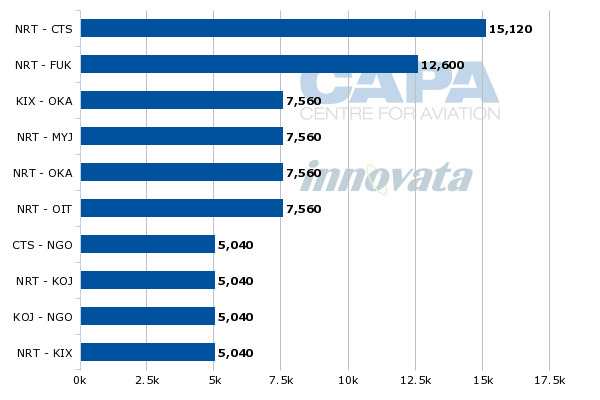 In the long term, a stronger Narita competitor will be a greater challenge for Jetstar Japan, which for a number of months enjoyed considerably higher load factors than AirAsia Japan. The short-term impact of AirAsia Japan on Peach should be minimal. The two had non-overlapping route networks and different operating bases. Once again, however, in the long term a stronger Narita LCC will be a greater challenge to Peach as the two continue to expand and undoubtedly start to overlap. Although the two share ANA ownership (although only minority for Peach), Peach has made clear that its business is independent of ANA and any ANA subsidiary, and as such would do what is best for Peach, not ANA. This feature was one which AirAsia Japan would have liked to follow, but the ownership structure meant that ANA controlled all decisions. ANA has made few network announcements, except to say the Narita LCC will serve domestic and short-haul international routes from Tokyo Narita and Nagoya. This broadly describes AirAsia Japan's current network. From its main Narita base AirAsia Japan serves the domestic points of Fukuoka, Okinawa and Sapporo, which Jetstar Japan also serves. AirAsia Japan also serves Taipei as well as Korea's Busan and Seoul Incheon. Jetstar Japan only has domestic flights. From Nagoya AirAsia Japan serves Fukuoka and Sapporo as well as Seoul Incheon. From Nagoya, Jetstar Japan serves Fukuoka and Sapporo but also Kagoshima. The revamped LCC will likely see network changes. At AirAsia Japan, the ANA and AirAsia sides disagreed on network strategy, with the AirAsia side typically persevering. It is to be seen if any of those unrealised network considerations were based on profitability and could be implemented, or were hangovers from ANA's lack of LCC experience. AirAsia Japan's network was not particularly entrepreneurial as it seemed largely to go after trunk routes rather than consider secondary points that may not have as much volume but carry a greater yield. Jetstar Japan has illustrated this concept with service to Kagoshima, while Peach's network comprises trunk routes but also services to many secondary domestic points like Nagasaki and Ishigaki. There is perhaps no greater difference between a full-service carrier and an LCC than exists in Japan. This calls for a leader who can put aside years of costly legacy practices to run a dynamic and lean LCC. ANA seems to have found such a person in Tomonori Ishii, who it plans to be the president of the new Narita-based LCC. Mr Ishii has been the SVP Americas and has spent over 25 years working on ANA's international expansion, primarily from a sales function. Mr Ishii will replace current AirAsia Japan CEO Yoshinori Odagiri, who in Dec-2012 replaced inaugural CEO Kazuyuki Iwakata. Neither Mr Iwakata nor Mr Odagiri cultivated a strong following. ANA undoubtedly finds confidence in Mr Ishii, a life-long ANA employee who 40 years ago started with the carrier as a passenger service agent at Osaka Itami airport. He exhibits classical deference to the company. In 2009 when the Business Renaissance Quarterly asked him how he wanted to be remembered, he responded: "I don't spend time worrying about how I will be remembered, but rather how ANA will succeed after my time." But Mr Ishii also has some relatively (for ANA) radical management practices. Japanese business culture is known for heavy top-down management style, and ANA says it was surprised to see AirAsia be less rigid, even at the top level: founder and CEO Tony Fernandes has been known to load bags onto aircraft and personally responds to customers on his Twitter account. Mr Ishii has expressed a preference for a similar bottom-up management style, and says that at ANA's Americas office he makes an effort to get out and talk with his staff. This should fit well at the re-vamped Narita LCC, which will need to make up lost time and missed opportunities with the Japanese public. AirAsia Japan partially failed by sticking to LCC practices not commensurate with the Japanese market, such as having a 45 minute check-in cut-off while Peach and Jetstar Japan were closer to 25 minutes. Passengers also had trouble using the website. At ANA these types of front-line issues would take ages if they ever reached senior management. At the LCC Mr Ishii could see the carrier respond quickly to what the market wants, which ANA will undoubtedly still be figuring out itself. "Talking to my staff is the best way I know of to keep informed of what we are up against. We must work together to change our perspective and approach," Mr Ishii told the Quarterly. His time in the Americas has coincided with ANA's strategy of using 787s to open thinner routes, which is rather far-sighted not just for a Japanese carrier but the entire competitive landscape. Mr Ishii's international experience should help as the Narita LCC expands its international footprint. Mr Ishii will be a strong counterpart to Jetstar Japan CEO Miyuki Suzuki, who is Japanese but also with a very strong international background. Will the re-launched Narita LCC be third time lucky for ANA? That is not to say Peach has not been a success, but it is weighed down by some legacy ANA practices an external team could not persuade their ANA counterparts to give up. ANA has been candid in saying that it has learned from LCCs and still has more learning to do, just as foreign companies do of Japan. To go from the backseat to taking the reins, even with consultants, on a project to be completed in an incredibly short period of time, is too far a leap. But just like ANA's initial reason to participate in AirAsia Japan, there may be no better alternative. A longer absence from the Tokyo market would be handing it on a silver platter to Jetstar Japan, partially owned by ANA rival Japan Airlines. A re-entry could be difficult. After seeing the AirAsia Group make what ANA views as critical mistakes, ANA undoubtedly feels empowered that it knows what to do. It may in some areas, but not in all. But few airlines get it right from day one and a key feature of the low cost model is to be fleet-footed and adaptable. The test of this will be in whether ANA's born-again LCC makes fewer mistakes this time around. AirAsia CEO Tony Fernandes, Jetstar Japan CEO Miyuki Suzuki, Peach Aviation Non-Executive Director Patrick Murphy and AirAsia CEO North Asia James Rhee will speak on the growth of Japanese LCCs and changes to Japanese tourism as a result of greater domestic and foreign LCCs at CAPA's second annual LCCs and New Age Airlines in North Asia Summit to be held in Seoul, 4/5 September. It is proudly hosted by Incheon International Airport Corporation and supported by Travelport, SITA, Sabre and Bombardier. Click here for full details.